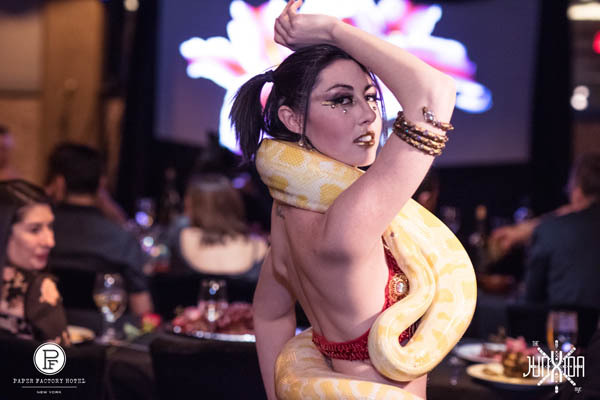 On Saturday February 11th, Long Island City’s Paper Factory Hotel hosted a pre-Valentine’s Day experience unlike any other with snake charmers, tarot, interactive art installations, DJ’s including Miss Sabado, 2Melo, $mall Change, and live acts including Zeb the Spy from Cairo, Avalon Jazz and Acapella Soul. Beginning with The Grand Feast, over 100 guests enjoyed a multi-course dinner toward an aphrodisiac appetite featuring oysters’ artichokes lobster, steak, truffles, chocolate fruits, and champagne infused whipped cream, courtesy of Chef Patrick Quinn. Throughout the dinner belly dancers from Sister of the Blooming Sun made their way around the tables, and performance artists entertained guests. As the clock approached midnight, guests dressed in red, velvet, lace and adorned with flowers poured through the doors for A Celebration of Love where they found contortionism by Nikki Ortiz, snake charming by Alyssamarie Portaro, body painting by Zen Koz, magic by Magnetic X, art by Humo Omuh, and Tico Chango, portraits by Walker Fee, art and performance curation by Lindsay Arden.